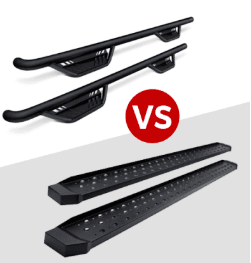 Nerf Bars vs. Running Boards: Which is Better? Nerf bars vs. running boards are accessories that provide a safe area to step onto when entering or exiting your pickup truck. They both attach to the bottom of the truck, can be made from various materials and come in various lengths. While the function of these truck accessories is similar, they have some important distinctions to consider that may play a role when it comes time to make your decision. According to Auto Anything, running boards generally provide a stepping pad that runs the entire length of the board. Nerf bars, on the other hand, provide a stepping surface at each entry point into your cabin. However, there are numerous styles, sizes and types of nerf bars vs. running boards. It’s important to explore information on each type of accessory to determine which is best for you. Truck manufacturers originally adopted nerf bars from the world of high speed racing. “Nerf bars, which were originally designed to fend off overly aggressive racers in the early days of professional car racing, are often pipe like fixtures that attach to the side of your vehicle.” 4Wheel Online, 2013. Furthermore, “these accessories help pickup truck drivers avoid some of the denting and mud splattering impacts of loose, bumpy gravel roadways.” (Platte City-Airport Chrysler, 2017) The bars also allow people entering the vehicle to wipe away mud and debris from their boots conveniently before entering the cabin. Nerf bars come in a variety of lengths and materials. They’re also usually made of aluminum or steel and can hold up to 500lbs. Some nerf bars offer rubber foot grips at each entryway of your vehicle for extra slip resistance, while other sleeker designs forgo this option. Some manufacturers offer wheel-to-wheel nerf bars that run the entire length of your truck cab, offering both easy access into the truck as well as the truck bed. Oval shaped nerf bars are another style to consider, as they’re wider and often more secure than round ones. Nerf bars offer protection from rock chips and other road debris while driving. During travel, your truck tires kick up various types of debris and grime; by installing nerf bars, you’re able to prevent some of this debris from hitting or scratching the doors and side panels of your vehicle. On the other hand, nerf bars can easily become slippery in cold, dewy or wet weather conditions. When this is the case, it’s important to wipe off the bars before standing on them. Running boards provide a step-up for shorter passengers. They come in handy for smaller passengers who may have trouble getting into and out of a vehicle, especially lifted vehicles. By offering some support for entering and exiting the cabin while also helping protecting exterior paint, running boards are great additions to your vehicle. (Auto Anything) They can often act as a doormat for people entering the vehicle; a place where passengers can wipe dirt off their feet before entering the truck. Running boards come in many kinds of durable materials, including aluminum, steel, plastic, and fiberglass. It’s important to find a material that is durable enough to last well overtime and maintain its polished, sleek look. Nerf Bars vs. Running Boards- Which is Best? e easily. Apart from the convenience they offer, they also make your pickup truck appear closer to the ground, giving it a more streamlined look from the side.